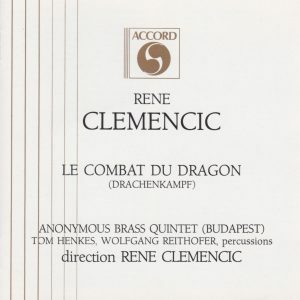 The Austrian René Clemencic is known primarily, and possibly exclusively, as a musicologist, keyboard and recorder player and, with his pioneer period-instrument ensemble “Clemencic Consort”, conductor, mostly of Medieval-to-baroque music. So, he’s a composer too. I bought this CD out of curiosity, I didn’t know at all what to expect, or rather, I expected some kind of neo-Medieval pastiche. Not at all – or only inasmuch as Carl Orff’s music can be considered “neo-Medieval pastiche” (which it isn’t, in my view). Drachenkampf, subtitled “Ballet-Pantomime”, was premiered in 1987. It is scored for brass quintet and percussion. The piece is supposed to depict a ritual of marriage – in the composer’s mind, maybe, but I hear more ritual than marriage. The piece can be heard as “pure” music, with no programmatic content. Clemencic’s style is fully contemporary, though not indebted to the serialist avant-gardes of the 1960s to 1990s. Certainly, he uses avant-garde techniques in his brass writing, but the music seems largely based on vehement brass interjections, melodic cells that are stated rather than (from what I hear) developed. For that reason, the music is reminiscent of Orff (but the later Orff of the Greek Tragedies rather than of Carmina Burana) and Varèse, but also, at times, of Romanian Oratio Radulescu’s idiosyncratic version of “musique spectracle”. 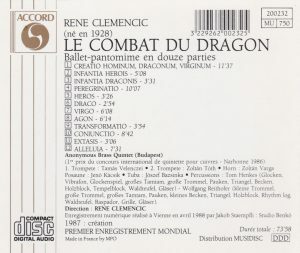 Other possible sources of inspiration, or reminiscence, are African percussion and avant-garde jazz where it meets contemporary classical (both on track 2, jazz in track 8 Agon, 11 Extasis). Some moments for percussion are beautifully eerie (try the softly tinkering bells over muted percussion at 9:48 in the first movement, for instance, and again, glockenspiel alone playing in the highest register, track 5, sounding like a childhood’s music-box). Track 7, Virgo, is also a very atmospheric and dreamy moment/movement, with horn intoning a deep “call to the horizon”, answered by echoes of itself and trumpet over softly tinkering bells. But the music assumes a more playful, even comical guise, in track 10, Coniunctio – it wouldn’t have been out-of-place in The Beatles’ Penny Lane, and strikeup the band. Appreciation will be matter of taste, I’ve just tried to give a hint of what the music sounds like. Fans of the avant-garde may find it too simplistic and “Orffian”. I’ve enjoyed it a lot, and immediately ordered more works of Clemencic, his Kabbala on Col Legno WWE 1CD 31861, bc 675754143626 or 5099703186123, and Apokalyspsis on Arte Nova 74321 72115 2, barcode 743217211523. TT 74 minutes, the liner notes contain very thorough, if somewhat arcane descriptions of each movement by Clemencic, but again the music can be heard with no programmatic underpinning. Additional info: Clemencic’s own website.